The New York Times on Sunday reported that Senate Republicans are preparing to advance two new bills rebuking anti-Semitism. The first indirectly admonishes Representative Ilhan Omar, the Minnesota Democrat whose critiques of the Israel lobby and deployment of anti-Semitic tropes have drawn condemnation. The second — a broad bipartisan effort targeting anti-Semitism on college campuses — passed the Senate in 2016, but stalled in the then-Republican-controlled House. Both suggest that the GOP’s long-standing lack of interest in anti-discrimination laws is shifting. The immediate impetus is the AIPAC Policy Conference, currently underway in Washington, D.C. Lawmakers on both sides of the aisle will spend the event wooing lobbyists and competing to outdo the other’s support for Israel — a sovereign nation whose existence, conduct, and interests are nonetheless regularly conflated with those of Jews and Judaism. Opposition to Israeli policy is thus taken as evidence of opposition to Jews. The willingness of some Democrats to speak out against Israel anyway has given Republicans an opportunity to smear them as anti-Semites in an effort to siphon off Jewish votes. It’s a cynical move for a party whose standard-bearer, President Trump, used to share anti-Semitic memes, trafficks in anti-Semitic conspiracy theories, and insisted there were “very fine people on both sides” of a white supremacist rally in Virginia where marchers shouted, “Jews will not replace us.” But it’s also the Republicans’ most explicit recent foray into identity politics — a term defined loosely as efforts to attract voters by appealing not to their stake in a larger national project, but to their membership in demographic subgroups, such as black or LGBTQ Americans. It is a strategy that Democrats have been most frequently accused of using, but which has been the GOP’s calling card for decades, ever since the Southern Strategy paved its way to becoming the party of white people. Today’s Republicans see in Omar’s gaffes a chance to broaden that cohort to include disaffected Jews without abandoning the bigotry that enabled its creation. Whether this gambit is successful is yet to be seen. 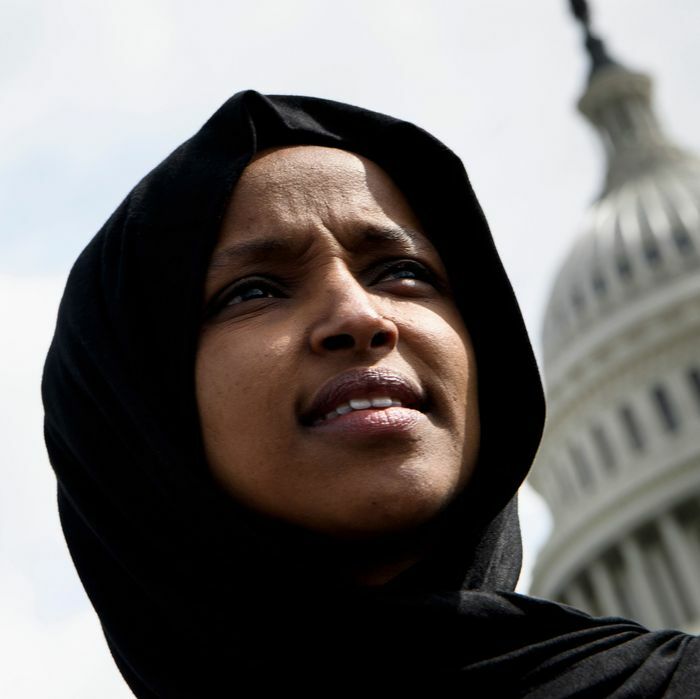 Jewish Americans overwhelmingly vote Democratic, and there are progressive Jews among Omar’s most vocal supporters, accusing her detractors of stifling debate about U.S. support for Israel. But it does illuminate the extent to which embracing or rebuking bigotry can be a matter of political expediency. As the Times points out, the GOP has typically opposed protections for vulnerable Americans, most recently under the Obama administration, when Senate Republicans opposed passage of the Matthew Shepard and James Byrd Jr. Hate Crimes Prevention Act. The bill — which added gender, sexual orientation, and disability to the list of federally recognized hate-crime metrics — passed in 2009 with only five Republican votes. Even as the rate of anti-Semitic bias incidents reached an all-time high with Trump’s election, the GOP has declined to rebuke, except in the vaguest of terms, the anti-Jewish sentiment his rise energized. But if the main critique of identity politics is that it is cynical and politically ineffectual — as even liberals and leftists have argued — then it is worth asking why Republicans keep deploying it. The answer, by now, should be evident: Identity politics allows the party to keep its white base in line even as its pro-corporate policies grow increasingly unpopular. Despite his dishonesty, misogyny, and habit of leering at his own daughter, Trump won the 2016 election by galvanizing the majority of white Americans through appeals to their nativist impulses. Immigration and terrorism were the two issues deemed most important to Trump voters, according to exit polling — expressed, respectively, in the form of hostility toward Mexicans and Muslims. The rest of his platform has been relatively standard fare for a Republican president, all things considered. Identity politics can be a political boon — but only if the correct form is utilized. Republicans pursuing bills that rebuke anti-Semitism suggests that they believe they can have their cake and eat it too. They think they can win elections buoyed by anti-Semitic nationalists while also fortifying their support among Jewish voters, Evangelical Christian Zionists, and any others gullible enough to believe that Ilhan Omar’s comments about pro-Israel sentiment being “all about the Benjamins” are more anti-Semitic than a president perpetuating lies and conspiracy theories that inspire anti-Semitic violence. And why wouldn’t they? Trump’s election has so broadened the terms of political acceptability that such contradictions no longer seem implausible toward building a coalition. If a party can so seamlessly unite white voters of all genders, income levels, and education levels toward a common goal, is it so unlikely the same is doable with anti-Semites and people outraged by anti-Semitism? And even if it ends up being a losing proposition, its brazenness is uncanny. What’s more, it bears few political costs for the Republican Party. This is not so on the other side. Omar’s attempts to speak out against Israel have cost her politically. Her own party had to be stopped from officially rebuking her by its more progressive members, who insisted upon a broader anti-hate resolution earlier in March. Republicans, on the other hand, have repeatedly won office on explicitly white supremacist platforms — in Trump’s case, riding a resurgence of nationalist activism to victory that counted anti-Jew animus among its calling cards. Today, the GOP has much to gain and little to lose by rebuking anti-Semitism. It is a testament to their successful weaponization of an opportunistic identity politics.